Sign up for email updatesJoin our mailing list for 15% off your next order—and be the first to know about new resources, translations, and how people are using our materials around the world! With hundreds of illustrations and clear instructions, A Community Guide to Environmental Health helps health promoters, development workers, environmental activists, and community leaders take charge of their environmental health in villages and cities alike. From toilets to toxics, from watershed management to waste management, from raising crops to rising temperatures, how we use natural resources affects our health and well-being. A Community Guide to Environmental Health provides the tools, knowledge, and inspiration to begin transforming the crisis in environmental health. 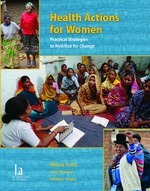 This book contains activities to stimulate critical thinking and discussion, inspirational stories, and instructions for simple health technologies such as water purification methods, safe toilets, and non-toxic cleaning products. 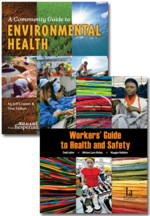 Chapter topics include preventing and reducing harm from toxic pollution; forestry, and land restoration; protecting community water and watersheds; food security and sustainable farming; solid waste and health care waste; and how to reduce harm from mining, oil, and energy production. With hundreds of drawings to make the messages clear, A Community Guide to Environmental Health is useful for people just beginning to address environmental health threats, as well as people with many years of experience in the field. "This timely guide is the Where There is No Doctor of community water, sanitation and environmental health. It makes water, health and hygiene accessible to those who need it most. Focusing on the important intersection of public health and risk reduction at the community level FOR the community, this guide is literally a lifesaver." "You have produced something quite extraordinary. The Community Guide will certainly be much used for the benefit of poor communities around the world. Too little has been done to provide this type of practical and useful information to communities. 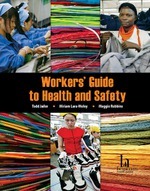 The human rights approach in the guide is especially useful." "A Community Guide to Environmental Healthwill restore hope in communities that they can play active roles in preserving environmental health and by so doing, stay healthy. With this excellent guide, community people can now learn how to protect themselves and also know what projects to resist in their communities. A very timely publication." "This book shows the myriad ways in which water is essential to health, and how our health is threatened by those who would deny our right to water through privatization, pollution, and profiteering. An incredible educational and organizing tool in the struggle for water democracy and global survival." "A Community Guide to Environmental Health, another great book of the Hesperian Foundation on helping communities, especially poor and marginalized communities is a welcome and very useful guide in addressing seemingly common but aggravating environmental health issues in the everyday lives of people that don’t have access to formal and expensive health care programs. This book offers inexpensive and practical and environment-friendly ways to handle health and environment problems in the home, workplace and in the community in general." Get 15% off your next order by joining our mailing list! Join and check your inbox for a coupon code.